Many of you have been asking us, either face to face during meetings and networking events, or via email, or social media messages, whether you should be giving money to street beggars and what is our opinion on this issue. While it is entirely up to you what to do with your spare change, our advice is to donate the money via a text message, which is an easy, instant, and a trustworthy way of helping a person in need. The Foxton Centre, alongside Preston City Council, Preston Police and Preston Improvement District, have come up with an idea, the #OffTheStreetsPreston initiative. The scheme is targeting those individuals who are NOT rough sleeping and are engaged in organised street begging and other similar street activity, whilst claiming to be homeless. At The Foxton Centre we work together in partnership with local services to get those genuinely living on the street access to housing and support. Since launching the initiative two individuals have gained accommodation and new contacts have been made with others. 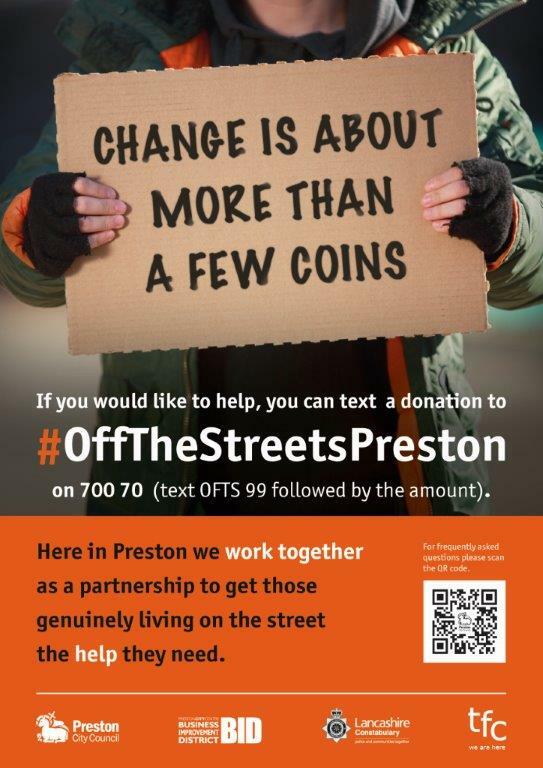 Donating to #OffTheStreetsPreston on 70070 enables rough sleepers to directly benefit from donations given. Whilst the Foxton Centre manages the fund, our charity receives no monies from it.